1. Cut the chicken form of dice, and hair-pin with a skewer and out to do, sisihkan. 2. Haluskan all ingredients except soy beans spices, citrus leaves and water until soft, then mixed with soy sauce, water, lime leaves and cook until cooked and oily, lift. 3. 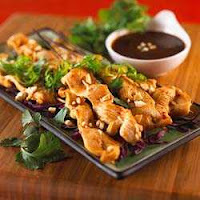 Lumuri sate chicken with soy sauce that has a little added flavor to the bean surface flat. 4. Sate fuel to be cooked while back and dilumuri sis soy sauce flavor, lift. 5. Serve chicken sate with peanut flavor, lime and lontong.